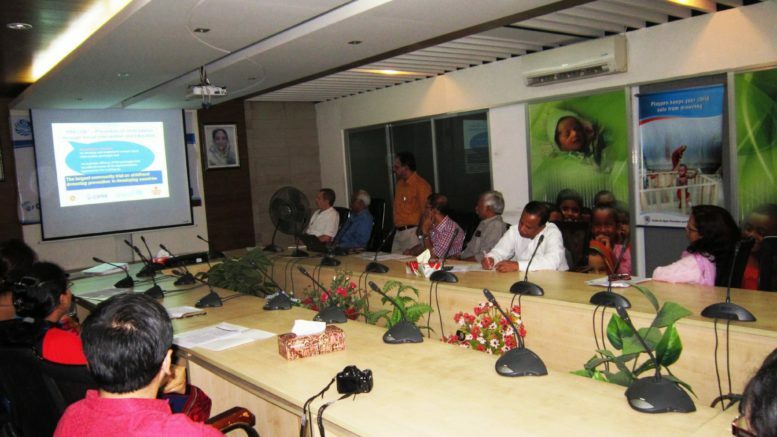 The CIPRB launched its “Bangladesh Anchal and SwimSafe (BASS)” research project at IMCI conference hall, EPI Bhaban, Mohakhali, Dhaka on 31 May 2014 at 10.00 am. The project is financially supported by the Grand Challenge Canada (Canadian Government). Considering the emerging health problems, University of British Columbia, The Alliance for Safe Children (TASC) and International Drowning Research Centre-Bangladesh (IDRC-B) of CIPRB has jointly designed BASS research project to prevent unwanted childhood deaths in Bangladesh. Dr. Alamgir Ahmed, Deputy Director, PHC & Programme Manager, MNH of The Directorate General of Health Services (DGHS) was the Chief Guest of the programme. Dr. Steve Beerman, Professor of Family Medicine of University of British Columbia, Dr. Michael Linnan, Technical Director of The Alliance for Safe Children (TASC) were the special guests. Dr. Aminur Rahman, Director of International Drowning Research Centre-Bangladesh (IDRC-B) of CIPRB was the keynote speaker at the programme. Professor Dr. AKM Fazlur Rahman, Executive Director, CIPRB concluded the ceremony with vote of thanks.